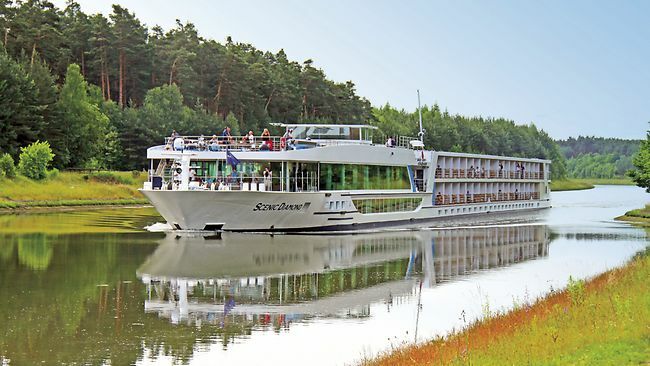 APT, Scenic and Evergreen may be new names to many, but together they are deep in the Australian psyche and are investing €360 million in European river cruise vessels. We have a quick look today at their latest moves. Meanwhile MSC Cruises’ MSC Armonia will finish her lengthening at Palermo in a few weeks, after which she will be able carry 400 more passengers. MSC has announced some special events for her November positioning voyage from Genoa to Las Palmas. And Saga in the UK is preparing to welcome bookings from travel agents instead of relying solely on direct sell as in the past. The Cruise Examiner for 22nd September 2014... .. 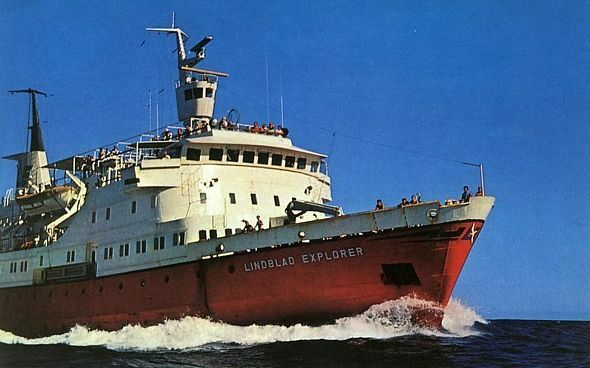 This month marks the thirtieth anniversary of the first full transit of Canada’s Northwest Passage by a commercial passenger vessel, with the Lindblad Explorer arriving in Yokohama on September 29, 1984. The 43-day voyage had departed St John’s, Newfoundland, on August 20. But things are now accelerating in the Northwest Passage. Last year saw the first commercial cargo, 73,000 tons of coal, move from Vancouver to Finland in the Nordic Orion, and this year the first westbound cargo, 25,000 tons of nickel concentrate, moving from Quebec to China in Fednav’s Nunavik. In 2015, Abercrombie & Kent will become the seventh company operating expedition ships through the Northwest Passage by chartering Ponant’s Le Boréal, and in 2016 Crystal Cruises plans to carry 900 passengers from Seward, Alaska, through the Northwest Passage to New York in the 68,870-ton Crystal Serenity. Fednav, a Canadian-owned company and world leader in Arctic navigation, announced that its vessel, the m.v. 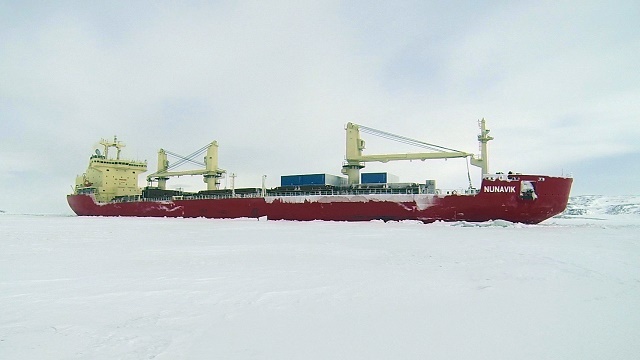 Nunavik sailed from Deception Bay en route to China via Canada’s Northwest Passage, with a full cargo of nickel concentrate. The Nunavik will be one of the first commercial vessels to transit the Northwest Passage completely, and the first to do so unescorted with an Arctic cargo, and with Canadian expertise. The Nunavik is the most powerful conventional (non-nuclear) icebreaking bulk carrier in the world, and sails from Deception Bay, Northern Quebec year round, transporting product from the Canadian Royalties mine. The Nunavik will deliver 23,000 tons of nickel concentrate to Bayuquan in China. Meanwhile, our own Northwest Passage passengers for 2014 arrived in Anadyr, Siberia, this week from Kangerlussuaq, Greenland, which they left on on August 26, in Ponant’s L’Austral. Ice conditions are fairly heavy this year. The ship needed an icebreaker in the Passage and was late arriving at Cambridge Bay and had to cancel her call there. The ice that is clogging the Northwest Passage right now is mostly multi-year ice breaking off from polar ice-packs and being pushed down from the Arctic Ocean. We now have six companies offering the Northwest Passage: Hapag-Lloyd Cruises, Ponant and Silversea offering the full transit while One Ocean Expeditions, Adventure Canada and Lindblad transit the passage from the east and turn at Coppermine or Cambridge Bay. You will find some of the links here on our Expeditions page. Crystal Cruises will transit the Northwest Passage from Seward, Alaska, to New York in 2006 with the 1,090-berth Crystal Serenity. Her passage has been planned by EYOS Expeditions and has been in the making for two years. Please call Gay Scruton on +44 (0) 20 7723 2450 for further details on this departure. For further details on booking any transit of the Northwest Passage please contact The Cruise People Ltd in London on 020 7723 2450 or e-mail cruise@cruisepeople.co.uk. In North America call 1-800-961-5536 or e-mail cruise@thecruisepeople.ca. Tahiti’s Compagnie Polynésienne de Transport Maritime (CPTM) has just confirmed to us that the Aranui 5 ‘s maiden voyage will be delayed by one sailing. At the moment, CPTM believe that she should be able to enter service with departure N°14/2015 (October 10, 2015). This date could change again in the future. To be on the safe side, passengers wishing to travel on the new vessel should probably book on Voyage N°16/2015 and thereafter. With these latest changes, for passengers already booked and wishing to travel on the new ship CPTM will allow them to postpone or even cancel their cruise without penalty. CPTM’s reservations department will shortly be contacting all operators and agents having passengers on these trips. Furthermore, CPTM has decided to reintroduce for 2015, their Senior Special (voyage N°12 – Aug 29th 2015). The discount granted will be 10% applicable to passengers already booked on this departure and also to new reservations (some conditions apply). For further details on booking on either the Aranui 3 or the new Aranui 5 please contact Miri Lopusna at The Cruise People Ltd in London on 020 7723 2450 or e-mail cruise@cruisepeople.co.uk. In North America please call 1-800-961-5536 or e-mail cruise@thecruisepeople.ca. Three ships, the MSC Monterey, MSC Geneva and most recently MSC Carouge, have now been placed into MSC’s Italy-Australia service via Suez. Each ship can carry six passengers in one Owners Cabin and two Doubles. These ships are 4,870 TEU (twenty-foot equivalent container) capacity vessels and single passengers are carried at a very modest single supplement of €15 per day on top of the normal fare. The overall route is : Valencia – Fos sur Mer – La Spezia – Naples – Gioia Tauro – Suez – Pointe des Galets(La Reunion) – Port Louis(Mauritius) – Sydney – Melbourne – Adelaide – Fremantle – Singapore – Jebel Ali – Ad Dammam – Jubail – Jebel Ali – Salalah – King Abdullah – Suez – Piraeus – Valencia – Fos sur Mer – La Spezia. One-way and partial bookings are possible but passenger bookings are not accepted to or from Middle Eastern ports. 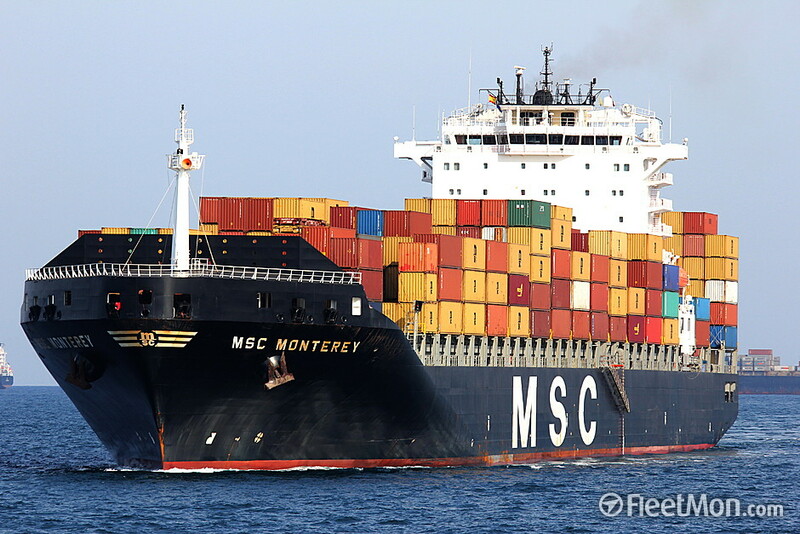 The MSC Monterey (pictured) is on charter until 2019, but, subject to renewal, MSC Geneva and MSC Carouge have charters that last only until January / February 2015. MSC Carouge from La Spezia about October 5, 2014. For this departure only we also can accept bookings to La Reunion and Mauritius. MSC Geneva from La Spezia about October 19, 2014 to Sydney etc or the full round voyage. For further details and bookings to and from Australia please call Miri Lopusna at The Cruise People Ltd in London on 020 7723 2450 or e-mail cruise@cruisepeople.co.uk. A Prestige Ship For Bermuda At Some Time In The Future? Norwegian Cruise Line ceo Kevin Sheehan was quoted in Bermuda recently as having said that with its acquisition of Prestige Cruises the “new” Norwegian group might take a bigger interest in the now underused Bermuda ports of Hamilton and St George’s. The maximum length of ship allowed in Hamilton is about 720 feet, on 26 feet of draft, and similar limitations apply at St George’s. The great advantage to Hamilton of course is that ships dock right on the city’s main thoroughfare of Front Street. Both Regent and Oceania have been to Bermuda in the past and indeed in 2003 Regent (then Radisson) ran the 560-foot 490- berth Seven Seas Navigator on eleven weekly cruises from New York and Norfolk to Hamilton and St George’s. Oceania, on the other hand, has put ships into Bermuda, on positioning voyages or seasonal cruises. At 594 feet, Oceania’s 684-berth “R” class ships Insignia, Nautica and Regatta can get into Hamilton and St George’s, but because of their length, the 776-feet 1,250-berth Marina and Riviera are restricted to Bermuda’s outlying Naval Dockyard. The “R” ships are only slightly longer than the Furness Bermuda Line’s 580-foot Queen of Bermuda and Monarch of Bermuda, which at one time were the mainstay of the New York-Hamilton trade. Of the three Regent ships, not only the Seven Seas Navigator but also the 709-foot Seven Seas Mariner and 677-foot Seven Seas Voyager, both with 708 berths, have docked on Front Street in the past. Indeed the Mariner and the Voyager became two of the largest ships to do so when they docked together in Hamilton in April 2008. At 732 feet, the 738-berth newbuilding Seven Seas Explorer, due in 2016, will be subject to approval by the local authorities as to whether she will be able to berth in Hamilton. That means that five or six out of the eight existing Prestige ships could be candidates for Bermuda. Hamilton will see only seven calls this year, with nothing between late April and mid-October, and St George’s only two cruise ship calls in the whole year. Azamara Club Cruises tried one season with its 684-berth “R” ship Azamara Journey on the New York-St George’s-Hamilton run in 2007 and then left. Between 2010 and 2012, in which year she made 19 voyages, Holland America Line ran its 719-foot 1,348-berth Veendam between New York and Hamilton, but she did not call at St George’s. After not being able to make enough money sailing to Bermuda, Holland America switched the Veendam to the Boston to St Lawrence trade at the end of 2012. However, with ships’ casinos now allowed to open in port, Veendam will test the waters again in 2015, making six sailings between Boston and Hamilton between May and July, alternating with her Boston sailings to the St Lawrence. Norwegian of course holds Bermuda contracts for the New York-Bermuda and Boston-Bermuda trades and has the largest ship in the Bermuda trade with the 4,000-berth Norwegian Breakaway serving New York, and the 2,476-berth Norwegian Dawn on the Boston route. Their ships will make 48 calls at Dockyard in 2015. For further details of cruising with Regent Seven Seas Cruises and Oceania Cruises please call Gay Scruton at The Cruise People Ltd in London on 020 7723 2450 or e-mail cruise@cruisepeople.co.uk. In North America call 1-800-961-5536 or e-mail cruise@thecruisepeople.ca. Last month, Norwegian Cruise Line announced its new 2015 all-inclusive program for North America, and this month it announced a similar program for the UK. There are some interesting comparisons between the two programs in that fare reductions that are a part of the package differ, as do rates of exchange used for different cruise lengths. Elsewhere in Norwegian’s “new” realm since they agreed to acquire Prestige Cruises, Norwegian ceo Kevin Sheehan remarked that Bermuda might see more Prestige ships in future years, as being a good destination fit for the Regent and Oceania cruise brands. And in China, Bohai Cruise has inaugurated its new cruise service using the 800-berth Chinese Taishan, formerly Costa Voyager.